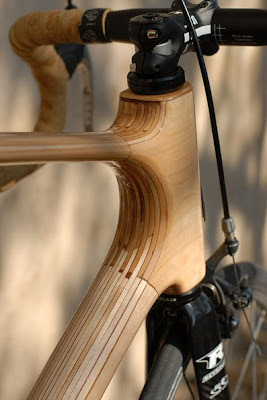 Century Cycles Blog: Sportin' Wood! If you are a fan of the unusual, this is sure to please. Perusing the Fixed Gear Gallery, I came across this gem. The builder, Alan Downy from Austin, Texas, constructed the frame himself out of 1/8" strips of birch. The end result is very beautiful and unique. If you want one, you'll have to build it yourself, Alan claims to have no intention of continuing production.